Windows 8 adds adaptive brightness to its tablets. A little sensor in your tablet constantly measures the room’s brightness level, and then adjusts the screen’s brightness to reach a comfortable level. The adjustments make the screen easier to read as well as prolong your battery life. However, overly sensitive adapters on some tablets lead to constant, distracting brightness changes. From the desktop Control Panel, tap the System and Security category, and tap the Power Options subcategory. The Power Options section opens to show two power plans, Balanced (recommended) or Power Saver. In the Balanced (recommended) section, tap Change Plan Settings. When the balance settings section appears, tap Change Advanced Power Settings near the window’s bottom. The Power Options window appears, letting you fine-tune your tablet’s power-saving controls. In the Power Options window, tap the plus sign next to the Enable Adaptive Brightness setting. Two options drop down: one for when the tablet runs on its battery, and the other for when it’s plugged in. Tap the word On next to both the On Battery and Plugged In settings; when the drop-down menu appears, tap Off to turn off the adaptive brightness. Tap the OK button to save your changes. That stops your tablet from constantly changing the screen’s brightness. However, the job of adjusting your screen’s brightness now falls in your lap. To manually adjust the screen’s brightness, fetch the Charms bar, tap Settings, and tap the Screen icon. When the bar appears onscreen, adjust the brightness by sliding the bar up or down. 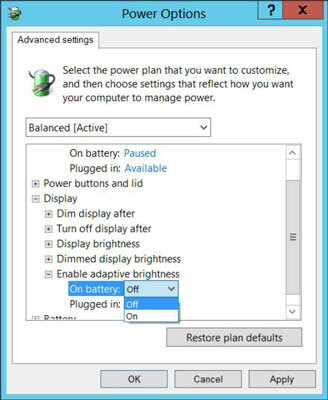 To return to your tablet’s default power plan, follow these steps again, but choose Restore Default Settings for this plan in Step 2.